Years, ago, in my late teens me (Angharad) and my friends were uber fans of the Swansea rock band Viva Machine. We used to follow them everywhere – from the small local gigs around town, to the big Student Union productions in Wales and England. Such was the obsession that we would plan our girly get togethers around Viva Machine’s tour dates! I remember one tour in particular where Viva Machine were supporting The Automatic (one hit wonders, with Monster) and we were there – The Swansea Massive - at Oxford Brookes SU, right at the front row cheering on those Swansea rockers. After the gig, like every other, we would hang around at the stage door eagerly awaiting a post-show chat with members of the band. Many years have passed, and a lot of history has happened since those heady, student days, but to cut a long story short, one of those groupies, eventually ended up marrying the drummer of the band. I wrote this tune as a wedding gift for Dai and Rhianedd Francis, who got married at St John’s Church, Gowerton in October 2016, and DnA performed it as they signed the register. Sadly, Viva Machine cease to exist, but Dai along with members of Viva Machine, now play in two other awesome bands. PICSEL and Broken Fires (for whom Angharad sometimes records string parts) are very much alive and gigging regularly – so go check them out! 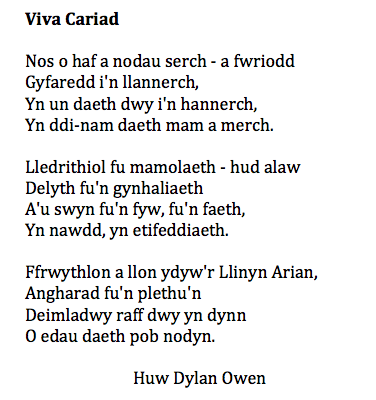 Blynyddoedd yn ôl, yn fy arddegau, roeddwn i (Angharad) a fy ffrindiau yn ffans mawr o'r band roc o Abertawe Viva Machine. Roedden ni arfer dilyn y grŵp i bob man – o’r gigiau bach lleol o gwmpas y dre, i’r cynhyrchiadau mawr yn Undebau Myfyrwyr ar draws Cymru a Lloegr. Yn wir, byddem yn cynllunio ein ‘girly get-togethers’ o gwmpas taith y band! Dwi’n cofio un taith yn arbennig pan roedd Viva Machine yn cefnogi The Automatic (pwy sy’n cofio’r gân Monster?) a daethant i berfformio yn Undeb Myfyrwyr Oxford Brookes (lle roeddwn i’n astudio ar y pryd). Fel pob gig arall, bydden ni - Y Swansea Massive – yn ymgasglu ar y rhes flaen i gefnogi’r rocars o Abertawe, ac ar ôl y shoe, bydden ni’n loetran o gwmpas drws y llwyfan, yn awchu am gael sgwrs gydag aelodau o’r band! Ta beth, sawl blwyddyn yn ddiweddarach, gwnaeth un o’r ‘groupies’ yna diweddu lan yn priodi drymiwr y band. Ym mis Hydref 2016 gwnaeth fy ffrind Rhianedd priodi Dai Francis yn eglwys Sant Ioan, Tregwyr. Gwnes i sgwennu’r alaw hon fel anrheg priodas iddynt, a gwnaeth DnA perfformio hi wrth iddynt arwyddo’r cofrestr. Yn anffodus, dyw Viva Machine ddim yn bodoli bellach, ond mae aelodau’r band wedi ffurfio dau grŵp gwych newydd, sef PICSEL a Broken Fires (fe glywch llinynau Angharad ar recordiadau Broken Fires). Ewch ar ei hôl nhw! Canmoliaeth o'r mwyaf yw i ysbrydoli pennillion fel hyn! 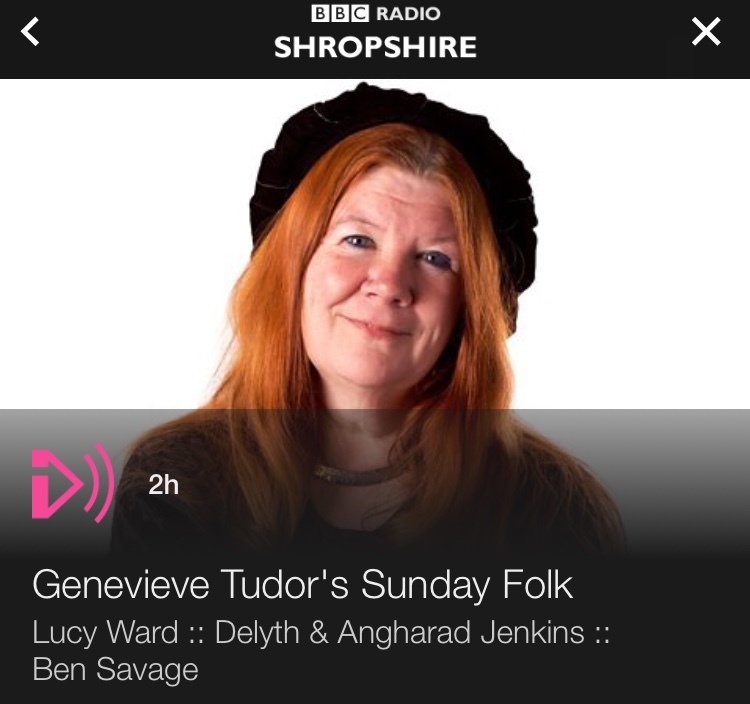 Thank you Genevieve Tudor for your kind words and the interesting chat recently on BBC Radio Shropshire. You can listen back to the conversation, where we talk about strong, creative women, and how working with an artist from a different medium gives a deeper meaning to our own work. From 1:02 to 1:26. And long after the programme ceses to exist online, we've transcribed part of the conversation about our relationship, and Carys Evans's wonderful album artwork, for you to read in years to come. G: What’s it like working with your daughter? D: Well, it’s an absolute joy! We get on very well. There’s lots of mothers and daughters who don’t get on particularly well together, but we are very close. In fact Angharad has a phrase that we’re sisters from another mister. So when we’re rehearsing, we get on well together musically and personally. Because it’s in the family, we feel a freedom when that we’re rehearsing, we can experiment and do what we want. If one of us says, “well, that’s rubbish!’ we don’t get offended. It gives a freedom artistically. Some times we have days where we’ll start off doing a bit of rehearsing, then have a bit of food, then have a walk by the seaside (we’re lucky enough to live by the Gower coast), then come back play some more music, perhaps have a beer or two. We just enjoy being together musically and personally. Someone once said about us, when we’re playing it looks like we’re breathing together. I think the fact we are mother and daughter, it’s good! It helps the musical relationship as well. G: And of course when you’re walking and talking, and having a cake and a coffe or a glass of beer, then you’re also creating. There’s part of your thread that’s still working. D: Absolutely. You can’t create in a rush. As Angharad said it’s taken four years to do this. But it’s been gestating over those years. G: It’s a beautiful cover, it really does look lovely. And you’re right about the soft colours. It’s important to have control. A: In this day and age, in the digital era, when so many people are listening to music online, through phones or computers, people forget how important it is to have a nice product to hold. I love visual art a well as music, and I didn’t want to loose that. We’ve taken a lot of time to get that right, and also to get the information inside right. That’s one thing you don’t get when you’re listening to music online, you don’t know who else is playing on the track, where it was recorded, when, what’s the background behind each track. When I was little I used to look at all the small print as see who everyone was thanking. It’s important to us say thank you to everyone who’s been involved, but I also think it might be interesting for listeners to know things like that. D: And also to have Carys’s lovely artwork to look at as well. Obviously we’re talking on radio so people can’t see the cover, but people have said that her style is almost like folk art, or a primitive art, which suits our music. She’s chosen those soft, feminine colours. But also, there’s an image of a harpist and fiddle player on the front, and we’re dressed in suffragette colours in this year 2018. It’s subtle, but the fact that we’re women and we’re strong is very important. G: I’m so cross I didn’t spot that! A: That was all Cary’s input. It was her who came up with that idea, and I was so glad when she said that. Of course! It’s so interesting to work with an artist from another medium. It gives a deeper meaning to our work. When we approached her, we’d already recorded the music, so she was able to listen whilst we were creating, but it’s enriched the music that we have on the album. D: When she was doing it, we were able to see all the different drafts. One of the earlier ones we were dressed in white. Often with the harp, you get characatured as a sort of angle type figure. But we moved on from the white, and we’re really pleased with the colours of it and how it looks. It's been five years since the release of our debut album 'Adnabod', but we're thrilled to be finally releasing our second album 'Llinyn Arian' into the world on the 8th June. 'Llinyn Arian' is all about relationships, with each other, with our friends and family, and with our surroundings. It is a celebration of life, and this this is our way of saying thank you! We will be celebrating with a very speical preview event at the Mission Gallery, Swansea on Thursday 7th June where we will be performing, as well as displaying the original artwork by Carys Evans. Afterwards, there will be a chance for the audience to enagage in a discussion with the musicians and the artist, to find out more about the unique creative collaboration between these three women. Mae pum mlynedd wedi mynd heibio ers i ni rhyddhau ein albym gyntaf 'Adnabod', ond o'r diwedd, ryn ni mor falch i allu rhyddhau ein ail albym 'Llinyn Arian' i'r byd mawr ar yr 8fed o Fehefin. Mae 'Llinyn Arian' am berthnasau, gyda'n gilydd, gyda'n ffrindiau a theulu, a hefyd gyda'n amgylchedd. Mae e'n ddathliad o fywyd, a dyma ein ffordd ni o ddweud diolch! Byddwn yn dathlu gyda digwyddiad arbennig iawn yn Oriel y Mission, Abertawe ar nos Iau 7fed o Fehefin. 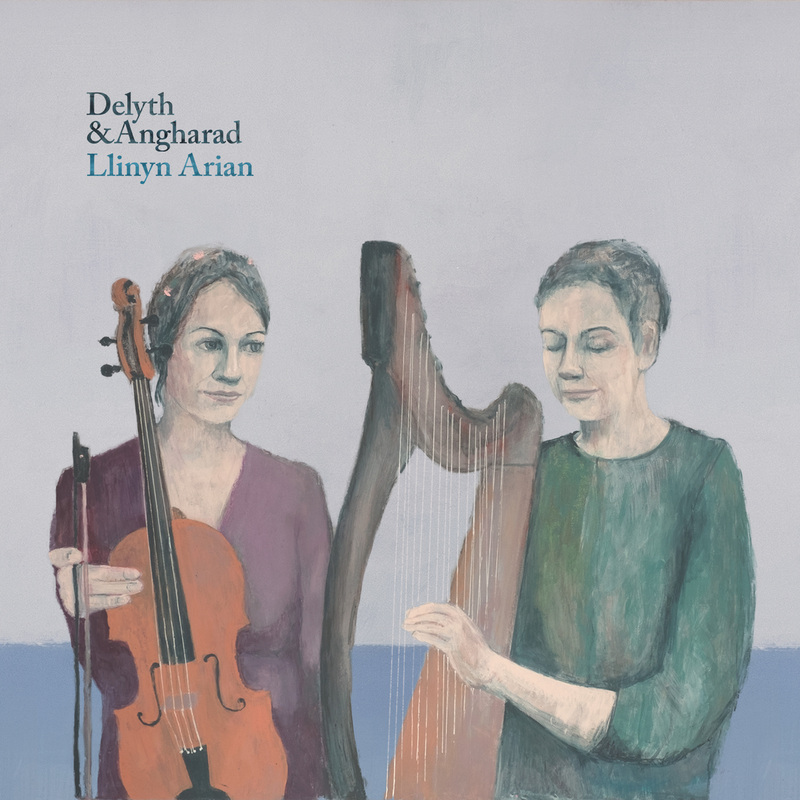 Ar y noson byddwn yn perfformio darnau oddi ar ein albym newydd, yn ogystal a dangos y gwaith celf gwreiddiol gan yr artist Carys Evans. Ar ol y perfformiad bydd cyfle i'r gynulleidfa cymryd rhan mewn sgwrs arbennig gyda'r artist a'r cerddorion i ddarganfod mwy am y broses creadigol, a'r cydweithio unigryw rhwng y tair ohonynt. We’re both really excited to be showcasing at Folk Alliance International, Kansas City this week. We’ll be flying out on Thursday, and have a busy schedule once we land. Check out our ‘Gigs’ page to find out where and when we’ll be showcasing. 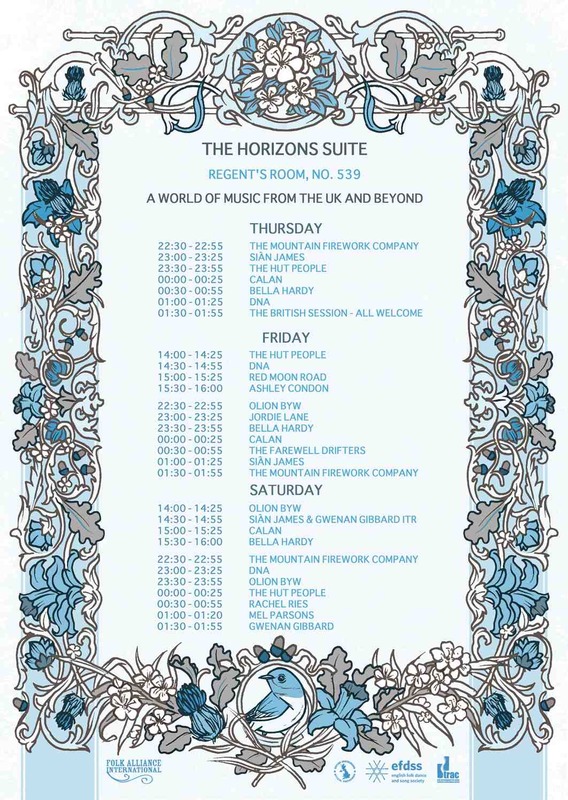 Looking forward to meeting some old friends, as well as making some new ones. Mae’r ddwy ohonom mor gyffrous i fod yn perfformio yn Folk Alliance International, Dinas Kansas yr wythnos hon. Byddwn yn hedfan mas i’r Unol Daleithiau Dydd Iau, ac mae rhaglen llawn gyda ni unwaith i ni glanio. Gweler ein tudalen ‘Gigs’ i weld ble a phryd byddwn yn perfformio. Edrych ymlaen yn fawr iawn at gwrdd a ffrindau hen a newydd. We had an amazing time at WOMEX in Cardiff recently.